Your host Samuel Hansen loves cities. Small Cities, Dense Cities, New Cities, Twin Cities, Reborn Cities, he doesn’t care what type of city cities. He loves them all. 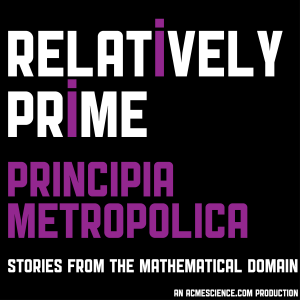 This of course made it inevitable Samuel would at some point become interested in the intersection of cities and mathematics, and once he became interested in that intersection it became inevitable he would have to make a podcast featuring stories about it. And now here we are. Cause and effect, it really is a marvelous thing. Michael Batty is the chair of CASA, the Centre for Advanced Spatial Analysis . He is also the author of the books The New Science of Cities and Cites and Complexity. Samuel spoke to him about how cities grow, the similarity of cities and trees, and the fractal dimension of cities. One truth about living in most cities is traffic, and quite often that truth is slow and all clogged up. As bothersome as all the traffic is, where there is a problem there is often interesting mathematics to do and in this case the mathematics is being tackled by University of Michigan professor Gabor Orosz. Samuel spoke with Gabor about why jams form, if there is any hope in the future for less of them, and what role robots in the hallways of the university play in his studies. Maths in the City is an outreach program conceived by Marcus du Sautoy which shows groups the mathematics of London and Oxford. Samuel spoke with one of the tour guides, Thomas Woolley about the program and some of the mathematical sights you could see on one of the tours. If these mathematical city tours sounds interesting to you, but you are not anywhere near London and Oxford do not fret as the Maths in the City website has you covered. There is an entire section where people can post their own examples of mathematics in cities all around the world, and you can easily search to see if there is any notable city mathematics near you. Lisa Schweitzer is an Associate Professor of Urban Planning at the Sol Price School of Public Policy at USC. Samuel spoke to Lisa about the intersection of urban planning and mathematics, where mathematical tools are the most useful, where they fall short, and what the role of mathematics and statistics will be in urban planning moving forward. Kolmogorov complexity can be thought of as the smallest amount of computational resources needed to designate some object. Sim City is a computer game where you build and manage cities. Samuel Arbesman is a senior adjunct fellow at the Flatiron Center for Law, Technology, and Entrepreneurship at the University of Colorado. Yes, they do all come together.